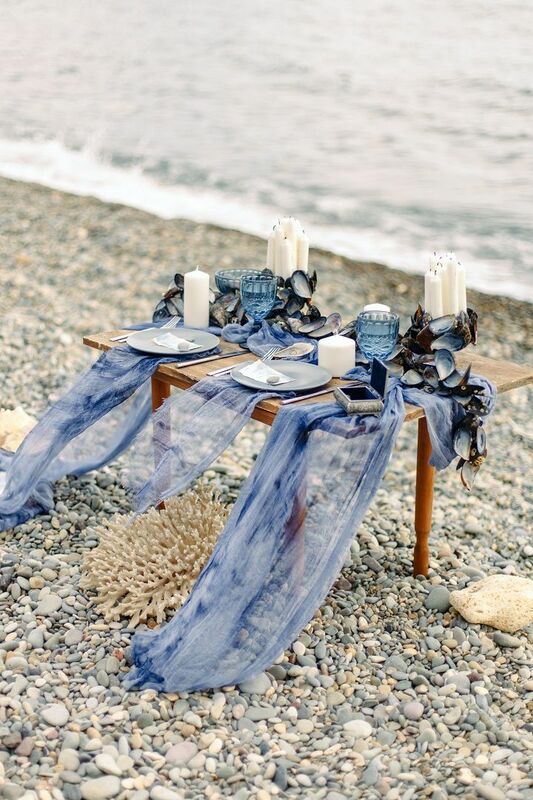 Is there anything more captivating than a beachside wedding? The short answer is no, but the longer answer? 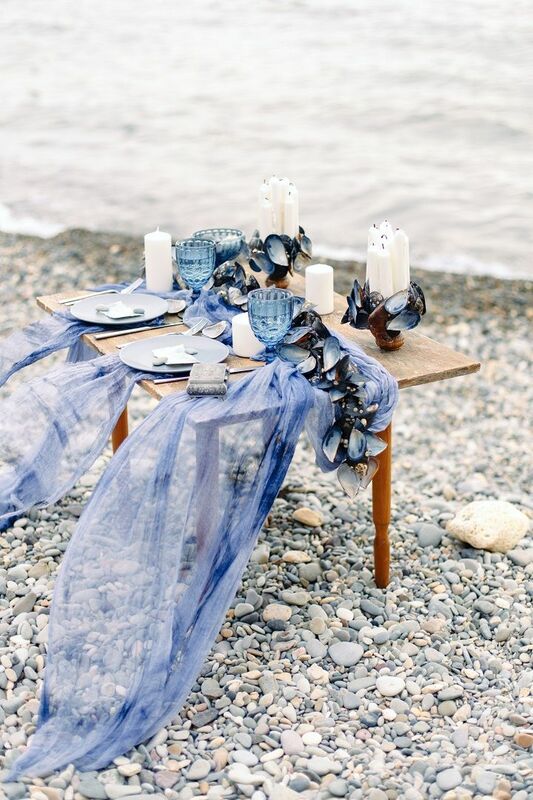 Well it goes a little something like this beachside wedding styled shoot. 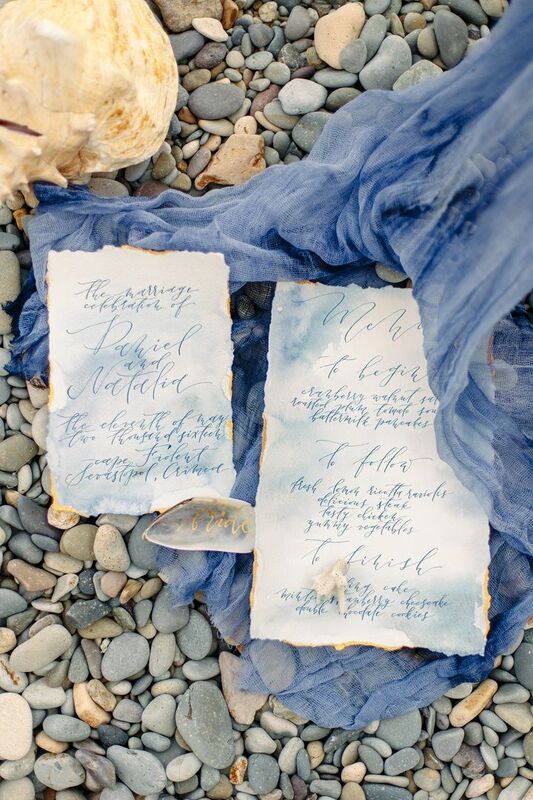 This gorgeous Cape Fiolent beachside wedding inspiration shoot in Ukraine. 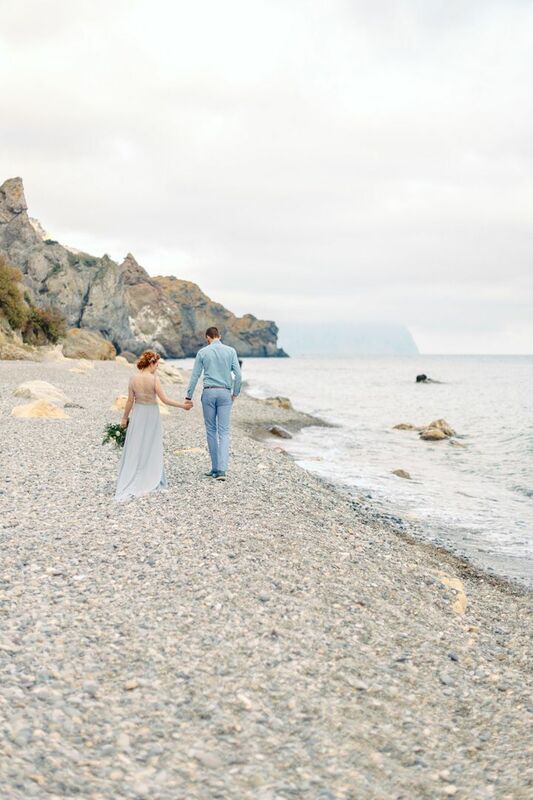 Natalia and Daniel are both photographers from a gorgeous place called Crimea on the Black Sea. Since they are very active and travel a lot, they have the inside scoop on some of the most beautiful locations in the area. 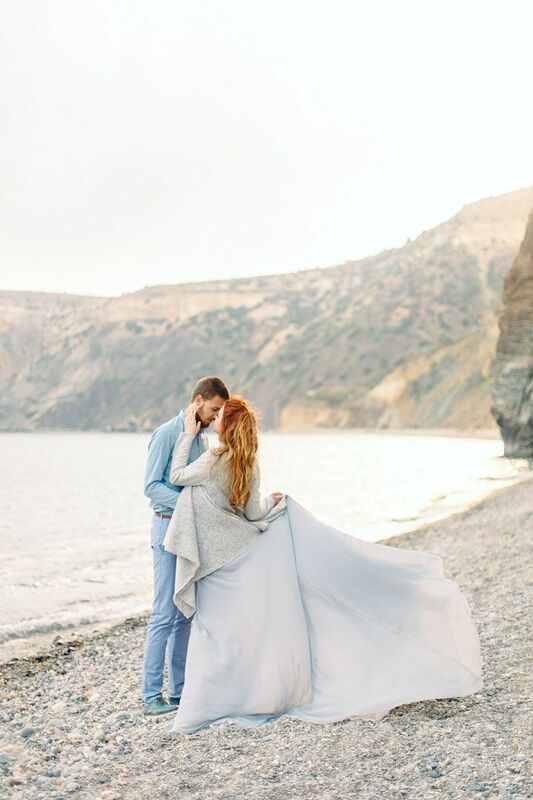 One in particular, Yashmovyi Beach, was a dream photo shoot location for them, as it’s a narrow beach made up of pebbles in various colours under a striking cliff. What wasn’t a dream was trekking up and down the 800 steps that leads to this secluded beach with all of the equipment! Fortunate for us that they did, though, because this stylized photo shoot is absolutely remarkable. 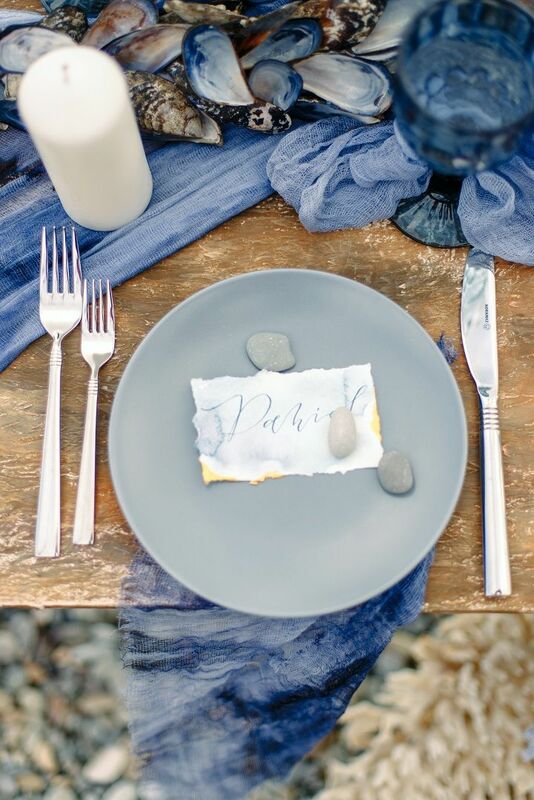 Mimicking the rich colours of the beauty around them, they used shades from dark to light purple hues, misty blue and grey. 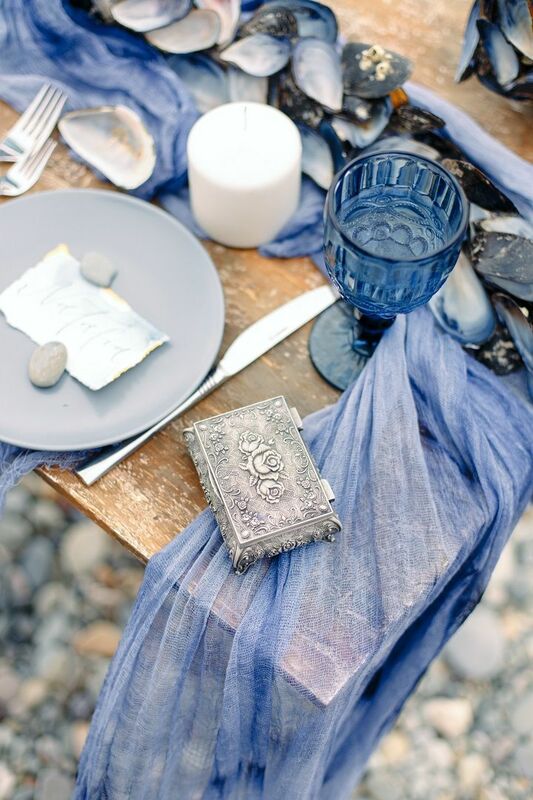 Their decor starts with an aged wood table, mimicking sun-bleached and sand-washed driftwood, draped in a breezy purple chiffon. 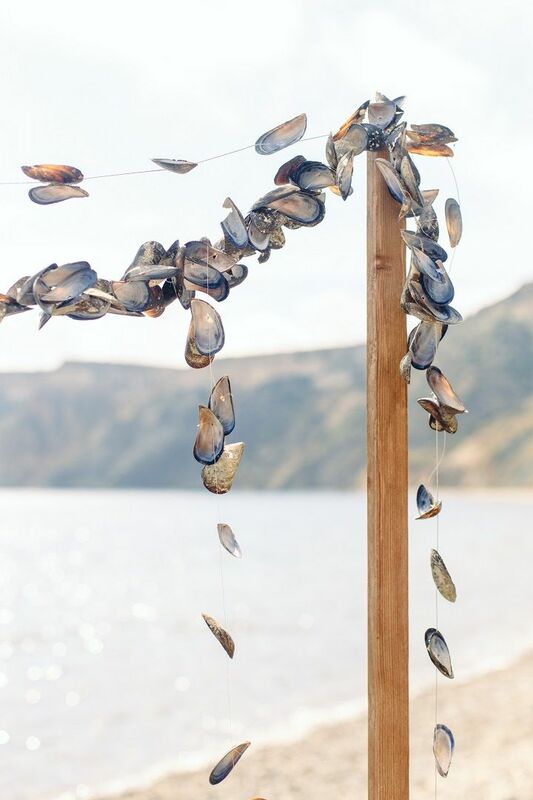 Garlands of mussel shells are a lovely nautical touch, decorating the table and hanging over their ceremony arch. 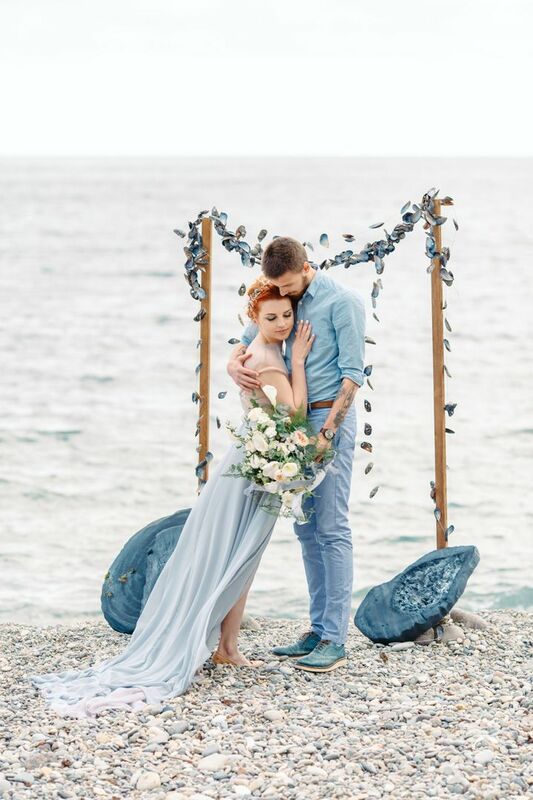 Pairing the misty blue and grey that the couple is dressed in with the rich shades of ocean blue and misty grey in the decor is a standout way to incorporate a beach theme for any wedding, whether it’s this spectacular exotic beach in Crimea or your backyard fantasy beach-themed wedding! 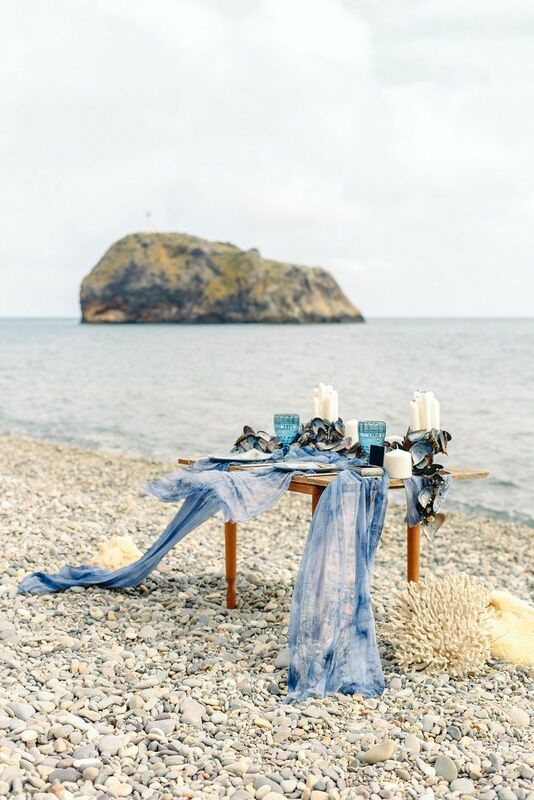 And the loveliest photographs by Tanya Khardova, this inspiration is out to prove that a seaside affair can also be magical. Believe me, this one you can’t afford to miss. 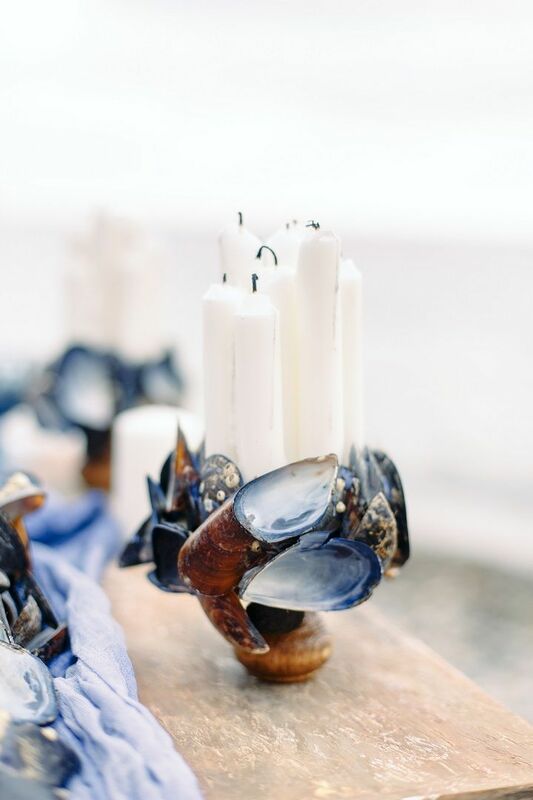 Garlands of mussel shells are a lovely nautical touch. 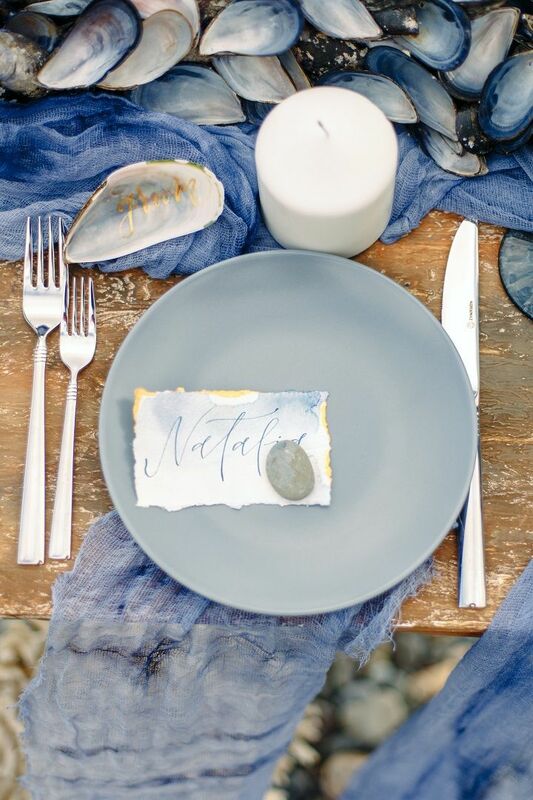 The perfect gold calligraphy written on mussel shell is one of those small elements with a big impact. 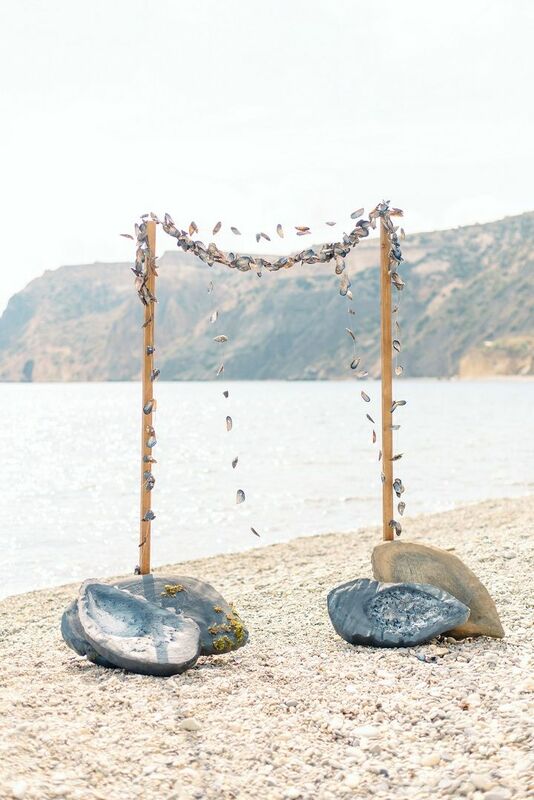 It takes the beauty of this romactic beach wedding Nadezhda Holopova. 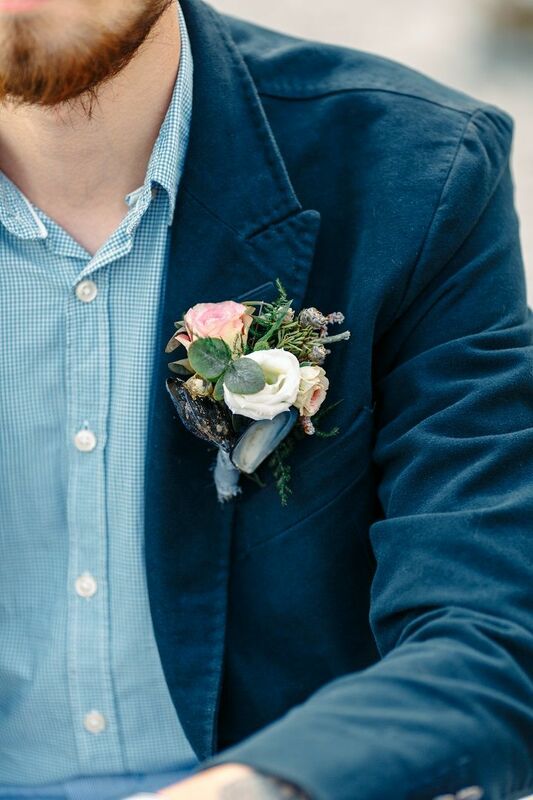 From Tanya Khardova Photographer…The couple’s names: Natalia and Daniel. They are both Crimeans. 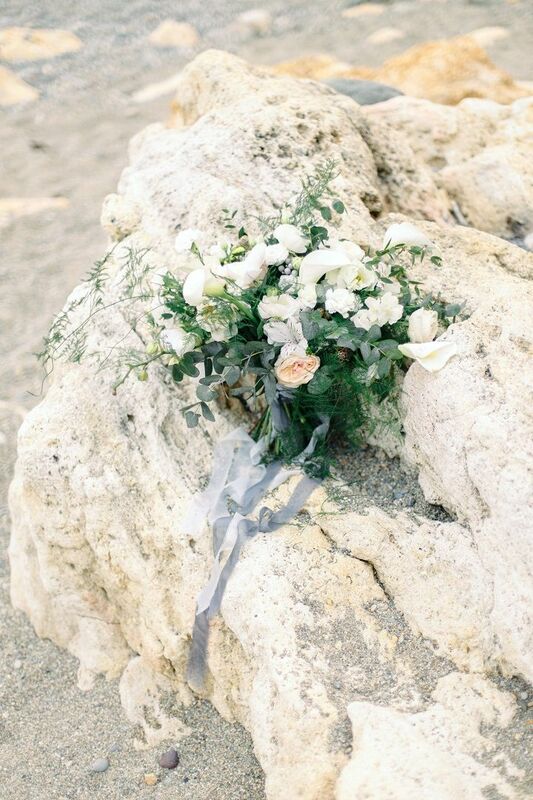 They lead a very active lifestyle, travel a lot in the Crimea, and know the most beautiful places there. However, they are also photographers, so they like to arrange a photo shoot for themselves and others. 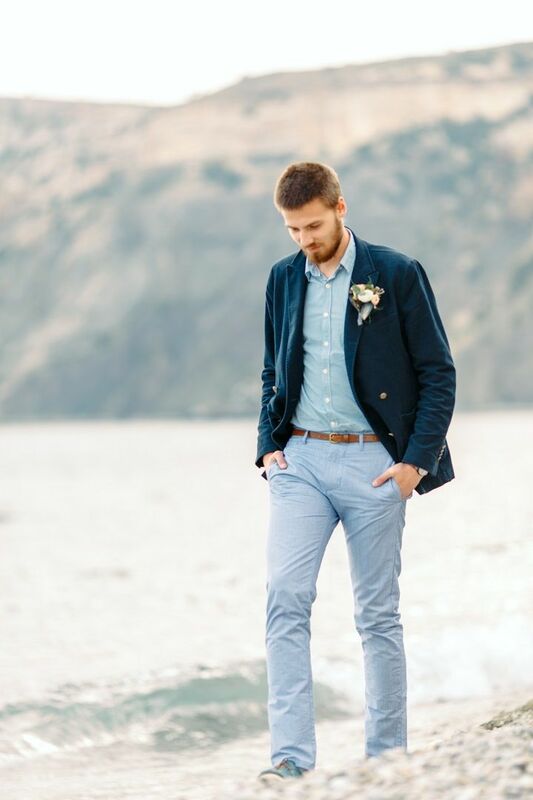 This stylized photoshoot was in the spring, because the beaches are deserted and there are no tourists. 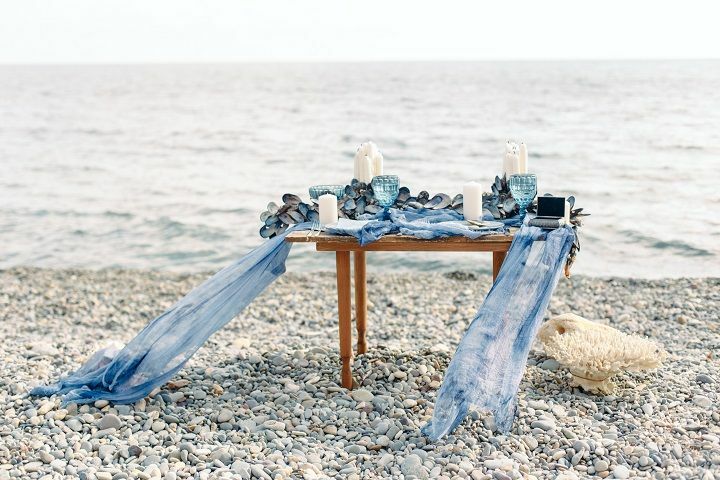 The photoshoot took place in a picturesque place Yashmovyi beach. Yashmovyi beach is a narrow strip with a length of 450 m from small pebbles of various colors under the cliff height of over 150 m. This is the heart of the Cape Fiolent. 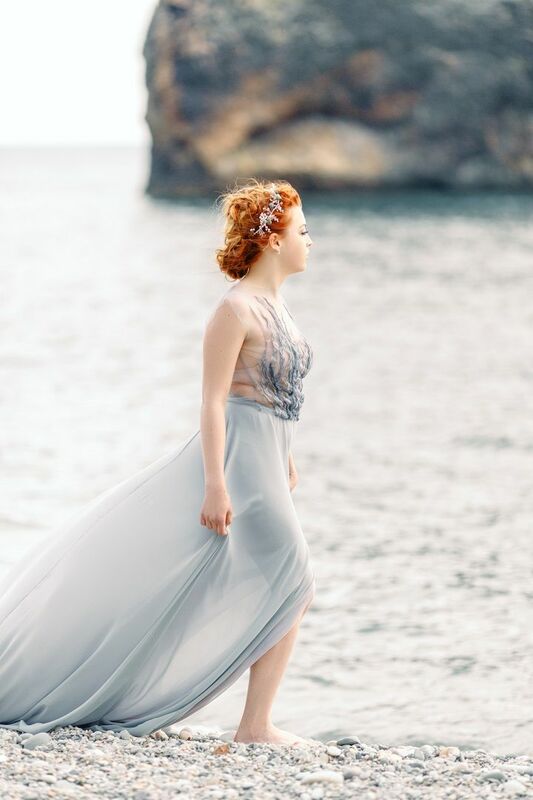 The beach is accessible only via a staircase of 800 steps, so it is a private place and it was very hard to pull down the props for the photo shoot. And it was even more difficult to go back up the stairs. We rested at every turn in the stairs, counting the steps and hoped that the next step will be the last! 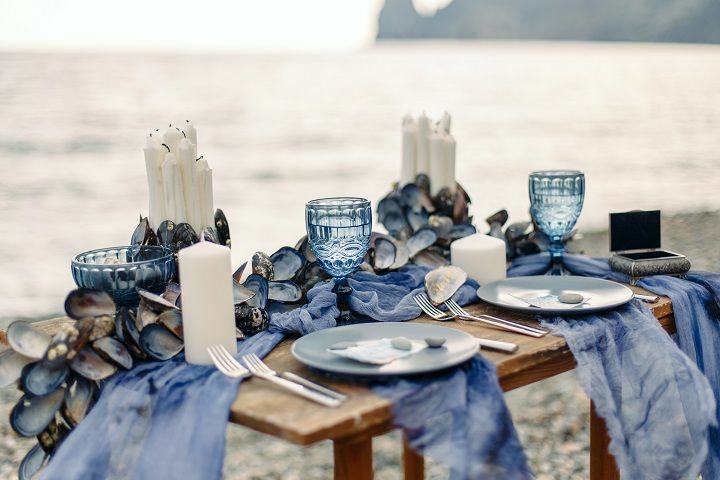 Handmade garlands of mussel shells with a beautiful purple color were used for table decoration and arches. And the aged surface of the table like tree trunks, bleached by sun and salt, and thrown out by the sea in a storm on the shore. 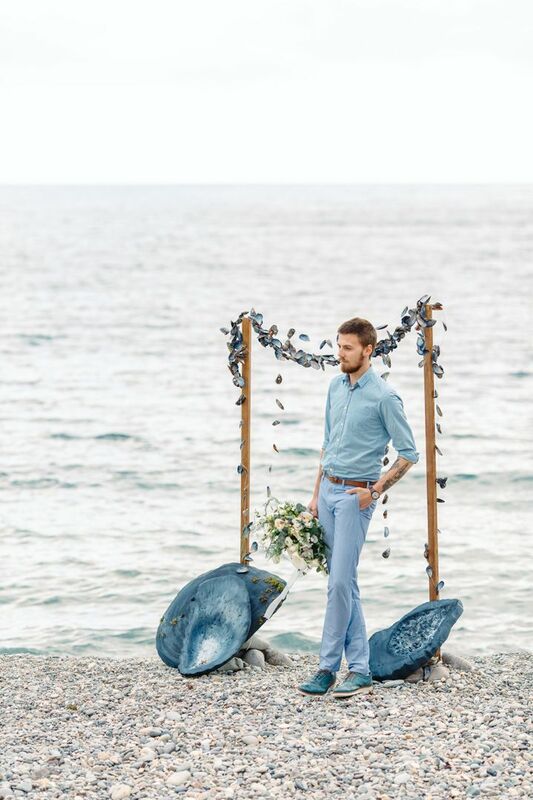 The couple was also dressed accordingly sea theme photo shoot in pastel shades of deep Black sea: misty gray, deep purple, light purple, blue and turquoise.